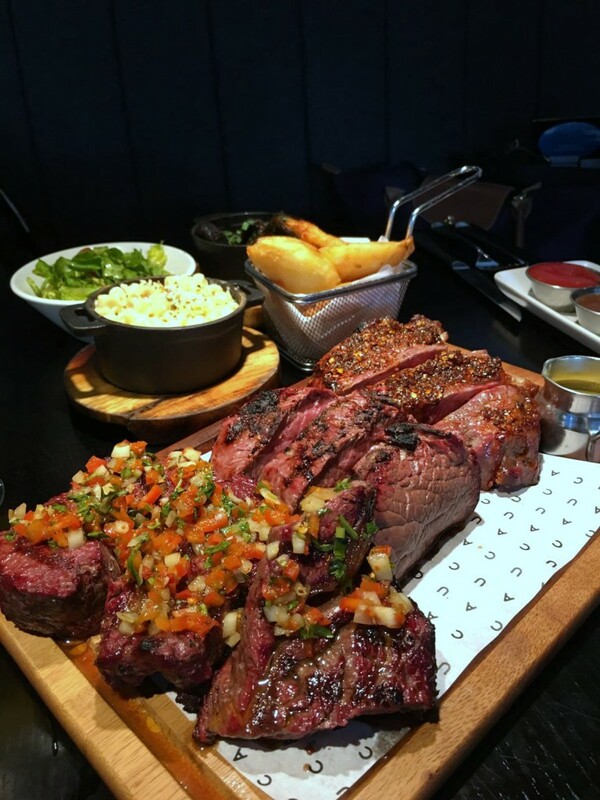 Cau (cleverly pronounced as ‘cow’) stands for Carne Argentina Unica, a chain of Argentinian steakhouses by the same people behind Gaucho. I visited the Cau St Katharine Docks branch which is located in the newly refurbished Commodity Quay. On good weather days, the front of the restaurant opens up for al fresco dining, overlooking the West Basin of the marina. Designed to embody the spirit of the trendy area of Palermo, Buenos Aires, the design of the Cau St Katharine Docks was sharp and funky with booth seating and bright blue sky and grass imagery. Cau has a quirkiness to it, notably with the waiters and waitresses wearing endearing ‘cauboy’ and ‘caugirl’ T’shirts. The menu at Cau displays the best of Argentinan grass-fed beef. Dominating the menu was a variety of steaks, burgers and steak sandwiches. But for non-steak eaters, there was also a choice of twice-cooked pork belly and fresh market fish. 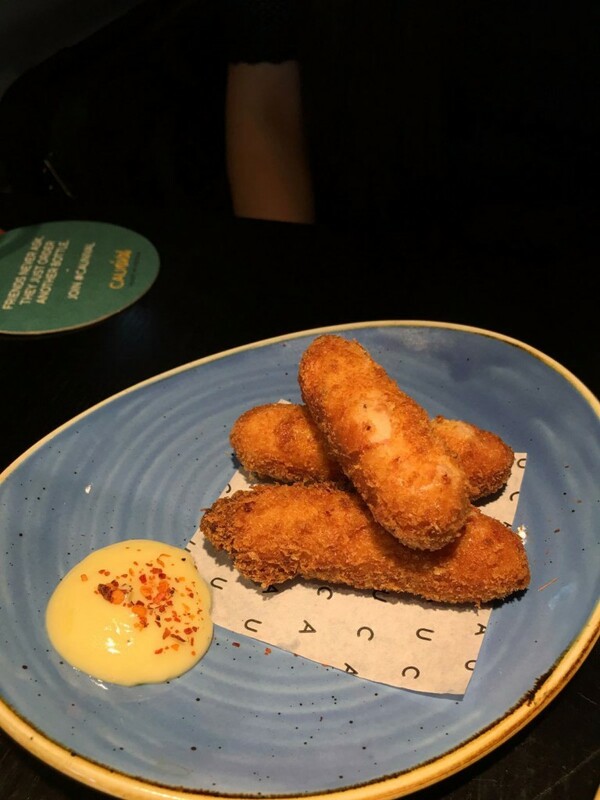 We began with a selection of starters, the first of which came highly recommended – the homemade jamon and manchego croquettes (£6). These were excellent, with a crispy crumb coating and a gloriously creamy filling. I would highly recommend trying these. 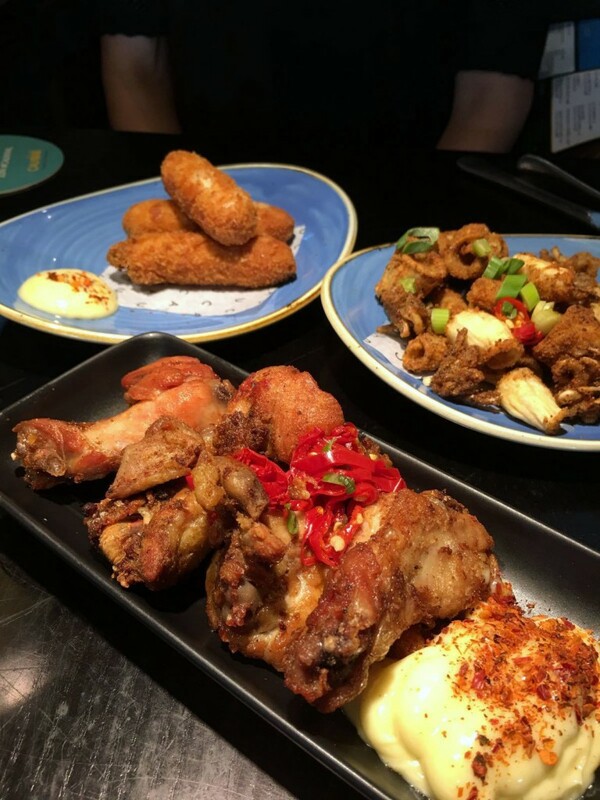 Pollo de chicarron (£5.50), crisp soy-marinated thighs and wings with smoky aioli were nicely cooked and moist, but not particularly crispy as it suggested on the menu. I would have preferred more seasoning on the chicken, although the aioli was delicious. 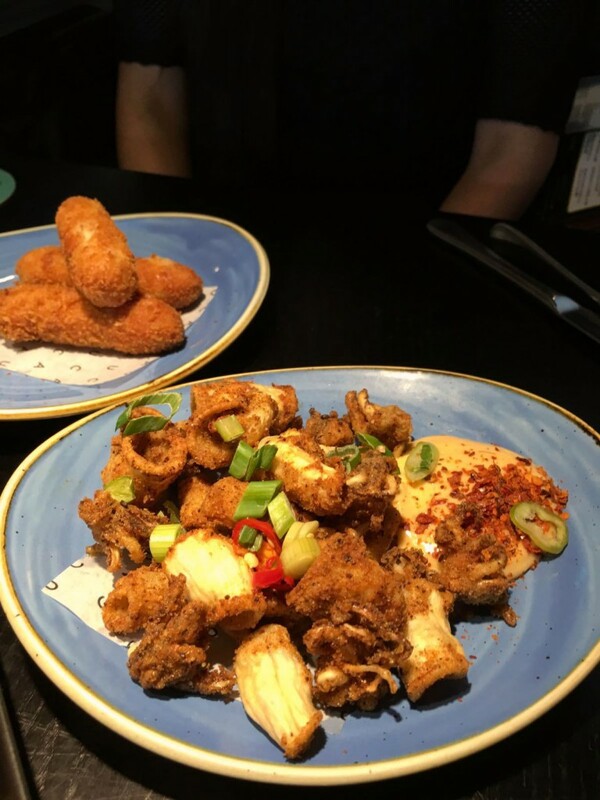 Salt and pepper squid (£6), deep-fried in a peppered flour and served with a chipotle mayo were disappointing. The squid was extremely overcooked, dry and chewy, rendering the dish inedible. For the month of August, Cau are serving a special #Caunival menu, run in association with Action Against Hunger. 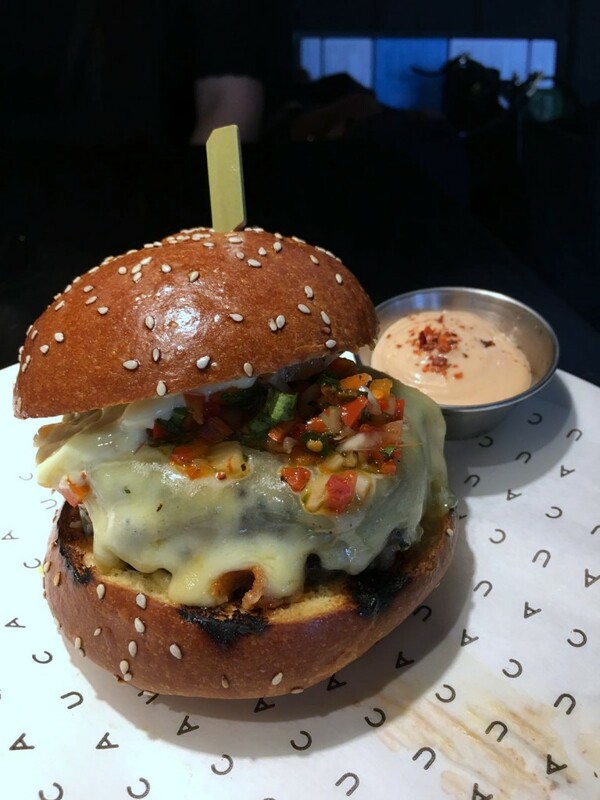 Included on the menu was a ‘DJ BBQ CAUnival’ burger (with chips – £12.95), made from a recipe created by DJ Christian Stevenson, aka ‘DJ BBQ’, with £1 from each burger sold being donated to Action Against Hunger. The burger patty was made with 50% Chuck, 20% Flank, 20% Brisket and 10% Aged Beef Fat and then injected with bone marrow. Topped with creamy Monterey Jack cheese and smoked garlic chimichurri, it was delicious, with the meat being moist, succulent and rich with flavour. To the steaks and the signature item on the menu was the Cau Feasting plate (£84.95) This consisted of classic steak highlights such as 400g each of the (from left to right) lomito, a fillet of rump which is considered the finest cut in Argentina; asado de chorizo, a sirloin steak in a churrasco marinade of smoked paprika, ají molido, garlic and parsley; and tira de ancho, often referred to as ‘the king of steaks’, it is a spiral cut of rib-eye, marinated in chimichurri and grilled slowly. All of the steaks were nicely cooked with a lovely charred flavour and with lots of flavour and were very tender. I would have preferred more seasoning on the steaks however, and I found the churrasco marinade on the sirloin slightly overpowering. The feasting plate comes with two sides from a choice of three, these being fries, sweet potato or salad. The fries were decent, although the salad looked a little limp. We also had roasted mushrooms (£2.95) which were yummy, and the truffle mac and cheese (£2.95) which was a little bland and didn’t have much flavour of truffle. 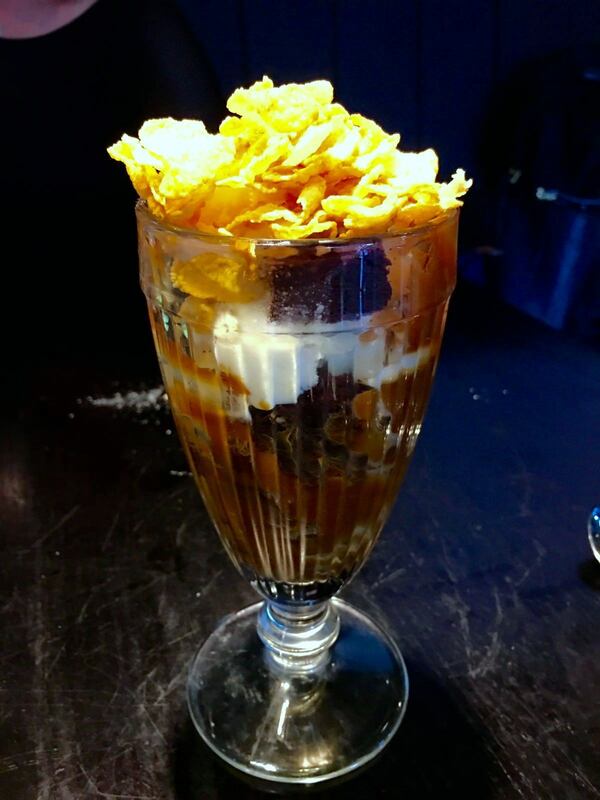 Touted as a must-try, the Cau Cornflake ice cream sundae (£5.95) – layers of cornflake flavoured ice cream with cornflakes and chocolate. I enjoyed the ice cream, and the combination of corn flakes and dulce de leche with the ice cream. However the brownie was stale and dry which really let this dessert down. 20p from each sale of this dessert is donated towards Action Against Hunger. Overall, Cau offers some good steaks and a respectable choice of starters. The vibe is fun and light and we had some good service. In the round, a decent steakhouse. 1) The jamon and manchego croquettes were divine. 2) The stale brownie in the ‘signature’ cornflake sundae. Price: £30 – £60 a head, excludes drinks and service.